Merchant Navy class 35028 Clan Line was built at Eastleigh in 1948 and rebuilt there in 1959. When withdrawn by BR in 1967 she was bought in working order by the Merchant Navy Locomotive Preservation Society, so never languished in a scrap yard. She has been “preserved” for rather longer than she worked for British Railways! Battle Of Britain class “light pacific” 34067 Tangmere (originally 21C167) was built at Brighton in 1947 and never rebuilt. 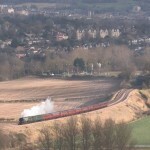 Withdrawn by BR in 1963, she was sold to Woodhams Bros scrap yard in Barry, partially restored on the Watercress Line and completed at Carnforth, and returned to mainline operation in 2003. 23-May The Eastleigh Centenarian (Waterloo-Salisbury-Eastleigh-Havant -Guildford-Leatherhead-Victoria) Red Post Junction (two angles); Grateley; Bitterne; Chalton Down. 15-Apr, 10-Jun, 22-Jul VSOE Special (Victoria-Salisbury-Westbury-Newbury-Victoria) Grateley; Bapton;Stockton; Etchilhampton; Wootton Rivers. 21-Nov The Merchant Venturer (Waterloo-Slough-Newbury-Bristol-Salisbury-Surbiton-Waterloo) Crofton. 12-Dec VSOE Luncheon Special (Victoria-Guildford-Victoria) Albury Heath (two locations). 28-Oct VSOE Special (Victoria-Didcot, Oxford-Victoria) Radley. 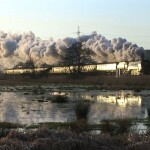 21-May Special stock movement: 35005 Canadian Pacific, 2MT 41312 and 850 Lord Nelson (in light steam) were hauled from Alton to Eastleigh, via Guildford and Havant. Seen at Chalton Down. 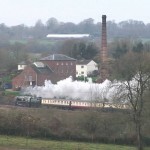 14-Feb The Somerset Explorer (Paddington-Newbury-Yeovil Jc-Templecombe-Salisbury-Reading-Paddington) Ufton Nervet; Aldermaston Wharf;Salisbury. 21-Feb The South Western Express (Portsmouth Harbour-Eastleigh-Basingstoke -Staines-Waterloo and return) Micheldever village; Old Basing; Waterloo; Clapham Jc; Battersea Reach; Wandsworth Town; Basingstoke. 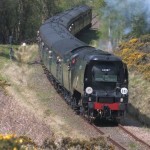 5-Mar ECS move with Queen Of Scots coaches (Southall-Banbury-Coventry-Nuneaton-Stafford-Crewe-Carnforth) Tackley. 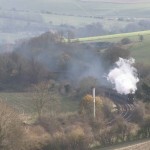 4-May The Royal Wessex (Swanage-Waterloo) Swanage (34070 Manston with a local service);Corfe Castle; Norden; Parkstone. 5-Jul The Cathedrals Express (London-Salisbury-Exeter, Yeovil Jc-London) Watchcombe; Widworthy; Yeovil Jc; Oborne; Grateley (2 locations). 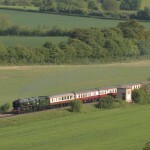 9-Jul The Cathedrals Express (Clapham Jc-Hounslow-Weymouth-Wimbledon-Waterloo) Winterbourne Herringston; Upwey; Parkstone; Shawford;Winchester. 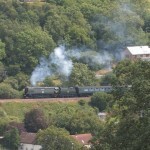 27-Aug The Cathedrals Express (London-Banbury-Stratford and return) Budbrooke; Bishopton; Cholsey. 29–Sep Private charter (Wandsworth Common-East Croydon-Shalford) Ranmore Common. 26-Nov The Bath & Bristol Christmas Express (Poole-Eastleigh-Bristol and return) Lockerley; Great Wishford; Hanging Langford; Corston; Keynsham. 8-Dec The Cathedrals Express Carol Concert Special (Waterloo-Gospel Oak-Stratford-Stowmarket-Ely and return) Battersea Reach; Thurston. 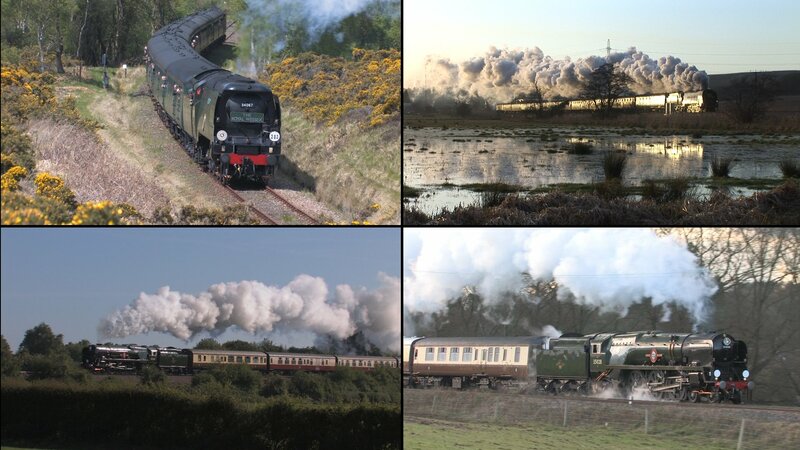 10-Dec The Cathedrals Express Carol Concert Special (Victoria-Redhill-Reading-Oxford and return) Ranmore Common (two locations); Culham; Appleford (light engine turning move); Radley. 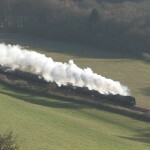 17-Dec The Cathedrals Express Carol Concert Special (Waterloo-Woking-Salisbury-Yeovil Jc and return) Battledown; Red Post Jc; Tisbury; Stowell. 15-Dec The Cathedrals Express Carol Concert Special (Waterloo-Staines-Reading-Salisbury-Westbury-Swindon-Staines-Victoria) Didcot.